Conservation Values: Agricultural productivity, scenic views, plant and wildlife habitat. 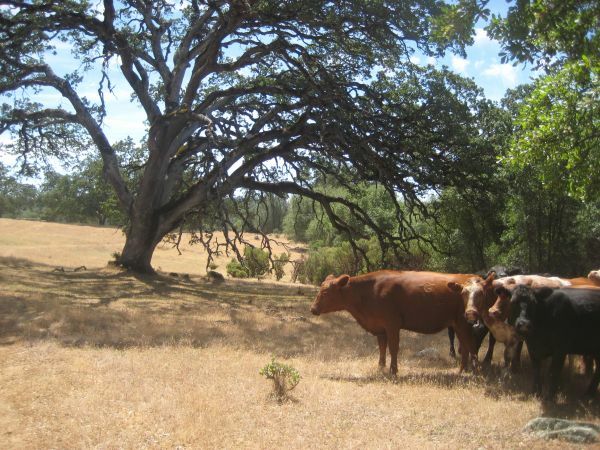 In late 2001, Anna Reynolds Trabucco and Bill Trabucco donated a Conservation Easement on their ranch, Linden Lea. The purpose of the easement is to keep the land in productive ranching and farming use forever. This type of easement allows for a variety of traditional agricultural uses on the land while restricting future residential subdivision. A short drive from downtown Grass Valley, the property was considered for heavy development several years ago. The beautiful 760-acre property’s primary vegetation communities are ponderosa pine forest, interior live oak woodland, annual grassland, and northern mixed chaparral. Breathtaking vistas overlook the South Yuba River canyon near the northern boundary. A herd of cattle graze the extensive rangelands of the ranch today just as they have done for generations. Future uses for the land could include planting orchards and vineyards. The owners have included special protection for areas with extensive oak tree communities.